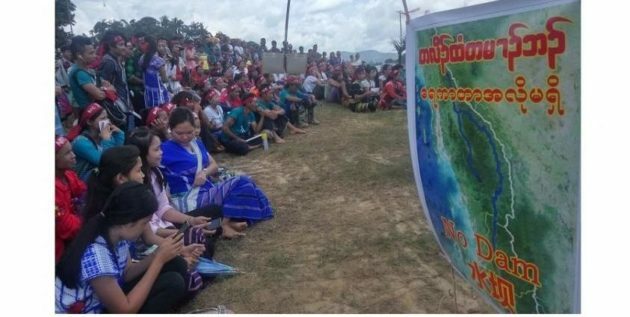 Indigenous people from the Tanintharyi Region gathered on September 13 to campaign against the plan to build a dam in the eastern shore of Sar Ya Bwin Village under Tanintharyi Township in Myeik District. The campaign was based on the United Nations Declaration on the Rights of Indigenous Peoples (UNDRIP), which was adopted on September 13, 2007. The campaign leader Saw Alfred said the campaign aims to oppose a Chinese company’s plan to build dams on the Tanintharyi River and call for recognition towards the rights of the indigenous people. “The dam [proposal] hasn’t been revealed to us in details. The entry of this project doesn’t meet with the FPIC (Free, Prior and Informed Consent), which is an international standard. We are highlighting what will happen to the health, education, and social [sectors] and how we will suffer in the future if these dams were to be built,” he said to Karen News. The dam project has been slated after a feasibility study was conducted in Nagar Ai, Kyauk Char, and Sin Phyu Tai areas but the public and civil society organizations do not know about the proposed project in details, Saw Alfred continued. The campaign was led by Chaung Ma Gyi Sustainability Group, which is a local community-based organization, and Khine Myal Thitsar (Committee for Sustainability and Development of the Natural Environment) from Sar Ya Bwin area and joined by their allied organizations – Southern Youth, Candle Light, Tar Ka Paw, TF-Tanintharyi Friends, and Myeik Lawyers’ Network – and over 400 local residents. “The indigenous people rely on the Tanintharyi River for their livelihood in the Tanintharyi Region. We’ve learned that a Chinese company is planning to build a dam. This dam will produce over 1,000 megawatts so it’s a serious matter and a challenge for them (the indigenous people),” Saw Sa Ngwe, in-charge of the Southern Youth, said to Karen News. This was the first time indigenous people from the Tanintharyi Region held the campaign based on the UNDRIP. The United Nations adopted the UNDRIP on September 13, 2007 with approval from 144 countries.